“Yo-ho-ho, and a bottle of rum”: a drunken Santa’s carol of choice? Perhaps, but more recently it’s part of a song audiences may have stuck in their heads after attending B.H. Barry’s production of Treasure Island at the Irondale Center in Brooklyn. Based on Robert Louis Stevenson’s novel, the play is ultra-entertaining and downright fun. Piratey pleasures are in abundance on the set: rum, swords, guns and, most importantly, treasure all make an appearance, as do a cast of seafaring scoundrels who pull the long ropes, climb the tall mast, raise its billowy sail, and row around on wooden boat decks, creating a convincing illusion of life on the high seas. Young Jim Hawkins is played by Noah E. Galvin who does an excellent job portraying the precocious youngster at the center of the story. The hearty song numbers are beautifully choreographed and aided by the impressive singing of Musical Director Ken Schatz who plays the part of the crooning Redruth. 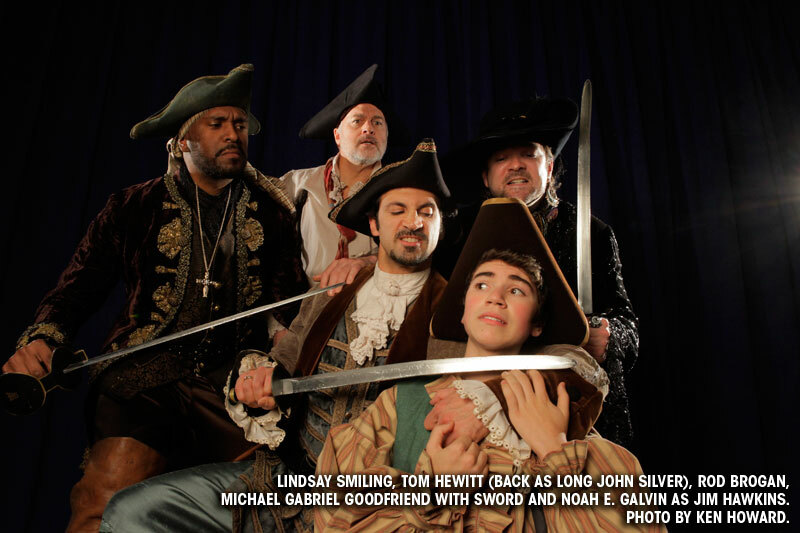 Tom Beckett’s embodiment as the stranded eccentric Ben Gunn is hilarious, and Tom Hewitt’s Long John Silver is as sneaky-sly as anticipated. And who better to direct this ensemble’s multiple brawls than Barry, the owner of a Tony award for choreographing fights? There’s enough sword action on stage, that younger patrons will surely enjoy the family-friendly theatrics in the play.